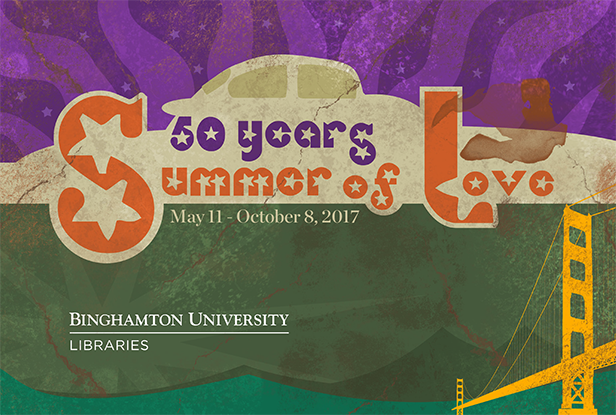 The exhibit showcases items from our Center for the Study of the 1960s collection that recall an important year in a tumultuous decade. The exhibit provides viewers with a glimpse into the past at the social, cultural and political movements that started or were advanced during the year of 1967. It features stunning rock concert poster art; books on Psychedelic art and the impact the movement still has on contemporary artists; and books on social activism of the late sixties and how those movements are still alive today. In Special Collections, an exhibit will feature materials from the Libraries’ University Archives that show facets of Binghamton University campus life: activism, academics, the social scene, and groups and clubs. Go back in time to gain an archival perspective of what was happening at the University back in the day. The exhibits are on view on the Glenn Bartle Library second floor mezzanine and in Special Collections (North Reading Room). This entry was posted in Binghamton University Events, Events, Exhibits, University Archives. Bookmark the permalink.